I always carry around small 3″x5″ notebooks to record the thoughts that pop into my head. I started doing this a few years ago, and I’ve filled more than I can count. They contain full essays, lists, sketches, and snippets of ideas – some grew into something, others are still waiting to do so. About 3 years ago, probably around June of 2010, I was sitting in my office at the school where I worked. Sitting with me was one of my top students – a talented kid named Mike, who I always saw as the same kind of creative individual as myself, and who I gave all the parts that I would give to myself (check out an interview with him here). Little did I know that for a few years he had been working on his own material – just basic comedy skits and some current events stuff – and had been collaborating with a friend of his. He had a name for it – “Paradoja” – which means paradox. 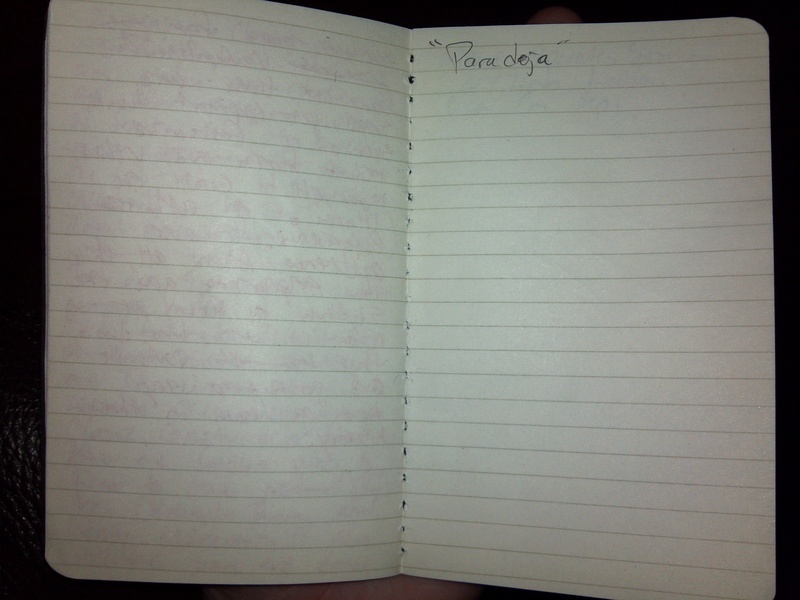 I wrote that name down in my small notebook, the image of which appears above. He wanted to turn his work into his own original show, but didn’t know how. He asked if I could help. I said sure. And the rest, they say, is history – paradojastudios.com. Carry notebooks everywhere. If you are any kind of creative person – doesn’t matter what medium – you need notebooks. Not only do they help you organize your notes, your thoughts, and your spur-of-the-moment brilliant ideas, but they help create a history for you. A portable archive that lives in the moment with you, but constantly reminds you of from where you came. And in those times of creative drought, looking back at your past ideas can help to spark new ones.